I’m working on a radio for a client, and it’s nearing completion, but I ran into a rather unexpected issue that was worth sharing on here. The radio itself is a Farnsworth K-262P, a radio/phono combination from 1951. The radio has seen some service in the past (more on that when I do a full write-up), but all of the capacitors had been replaced with Cornell Dubilier brand dipped film capacitors. These are modern construction from the 1980s or so – not the old waxed paper capacitors common up through the 1960s. A shockingly high number of these dark red capacitors have failed completely. They’re modern construction, but apparently not as modern as we’re using today. I’ve been replacing them with modern metalized film capacitors (rated at 400-630V) which are being run far below their rating – I expect it will be many thousands of hours of operating, if ever, before it needs to have signal capacitors serviced again. 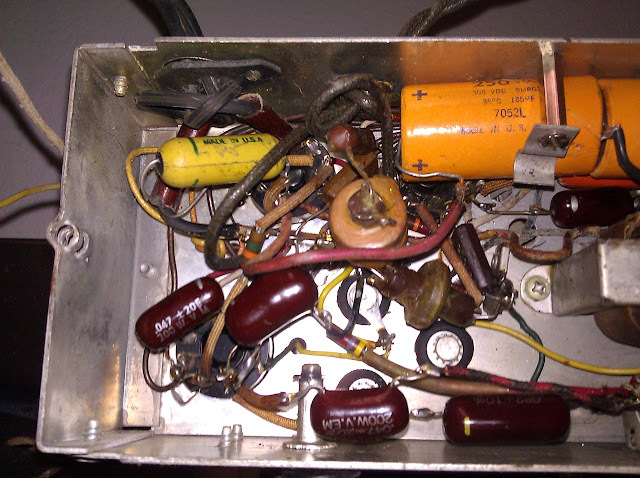 This entry was posted in Commentary, Electronics, Photos, Projects, Radios and Tubes, Vintage and tagged bad capacitors, capacitors, Cornell Dubilier, Farnsworth, K-262P, photos, repair. Bookmark the permalink.